The following table shows the asset classes we use in our portfolio and the benefits that each provide. We do not include commodities or natural resources in our asset class set. The reason is that the Canadian economy, and the Canadian stock market are highly correlated with commodity prices. As such, commodities as an asset class do not offer the same diversification benefits to a Canadian investor as a US or European investor. The proportions of each asset class in a client portfolio is a function of the risk-level for that portfolio. In order to determine the appropriate asset class proportions for each risk level, we follow a variation of a methodology developed by Nobel Prize winning economist Harry Markowitz called Mean-Variance Optimization (MVO). The standard deviation and correlation of asset class returns are calculated from the monthly return data for the last 10 years. We have built internal models to calculate expected returns for each of the asset classes we include in our portfolios. For stocks, our models look at current dividend yields, growth in earnings per share, and long-term price to earnings ratios. For bonds, we look at factors such as current yields and interest rates; long-term interest rate forecasts, and the bond portfolio’s duration and convexity. For REITs, our models look at dividend yields, growth in dividends per share, and the yield spread between real return bonds and REITs. In order to account for the uncertainty in the expected returns of our asset classes, and to reduce the optimization’s sensitivity to input parameters, we simulate thousands of possible return scenarios within the constraints of asset class expected returns, standard deviation, and correlations. For each scenario, we calculate the optimal portfolio. We then use an averaging technique to combine the results of each simulation to arrive at our recommended asset allocation. 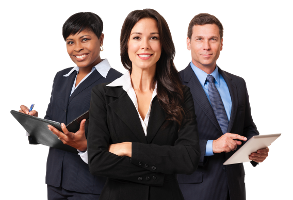 This process is often called Resampled Mean Variance Optimization in the financial industry. The model portfolios that we arrive at using this method are less sensitive to changes in input assumptions, and are expected to perform well under different market environments. 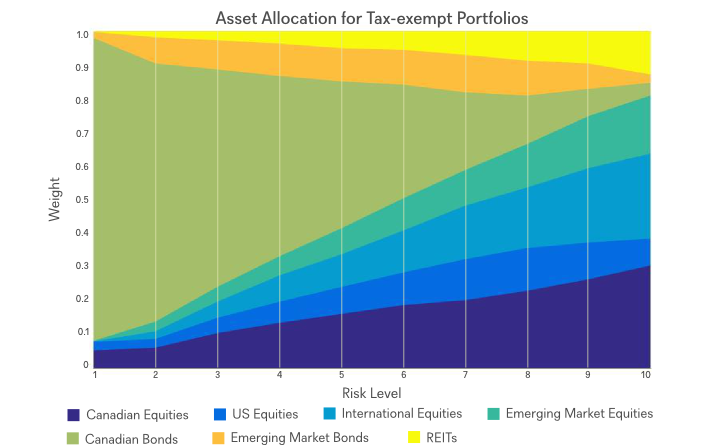 The following charts show the recommended asset allocation for taxable and tax-sheltered accounts at each risk level.